As an ERP Training Consultant, you will work on major implementations of enterprise-wide cutting-edge IT systems projects. You will work with client project teams to identify business processes, user roles and appropriate change and IT training strategies. You will be involved in developing bespoke training documentation and eLearning, as well as delivering presentations and training sessions to user groups within the business to help make change happen. Business change analyst: you will learn and digest new system functionality and business processes, translating these into a language that an end-user will understand to bring about change. 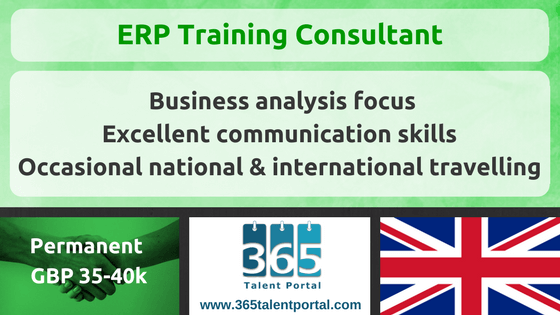 Consultant: as a consultant, you will provide advice support for the client and your colleagues. As you become familiar with company’s processes/methodology, you will offer advice to clients on how best to approach their training programme. Instructional content designer: you will produce an array of documentation so written skills are imperative in the role. The types of material you would produce include: Quick cards, Presentations, Lesson Plans, Reference guides, Video scripts, eLearning scripts and Lanyard/Z-card learning tools. Training Consultant: on occasion, you will be delivering classroom training, presentations and possibly recording videos and eLearning. Floorwalker: provide at-desk support to end users once the system has been implemented. Team player: above all, you must be a team player. Whether working on a project on your own or with a team, you are part of the company.